PresenceMe Digital Marketing is the Award Winning of "MOST OUTSTANDING FOR SEARCH ENGINE OPTIMIZATION 2018 - ANDALUSIA"
Your best option for ENGLISH and SPANISH DIGITAL MARKETING. SEO Audit, SEO Services, SEM Adwords Campaign, CONTENT MARKETING, DIGITAL CONSULTANCY. WE ARE CERTIFIED BY GOOGLE AND HUBSPOT. DIGITAL MARKETING SEO and SEM, CONTENT MARKETING and CONSULTANCY that meet your expectations. Show the best of your business and your personal brand. ENGLISH and SPANISH CONTENT MARKETING because content is king. Creativity, Ideas and Innovation for the best online presence, credibility and reputation. Digital Content Marketing in Spanish and English. The best from PresenceMe: We are in ✓ Top 10 SEO Agencies in Andalucia, Spain. The BEST CONTENT MARKETING for the best projects. Define a great Content Marketing Strategy. TRANSLATION, EDITION and PROOFREADING SERVICES for the best MULTI-LANGUAGE Websites. Expand your business into new languages: English, Spanish and German. WEB DESIGN and DEVELOPMENT, BRANDING and STRATEGY. Innovation is a must. Websites for Business, Brands, Personal websites, Blogs and Online Stores. DIGITAL MARKETING CONSULTANT ready to help you. CONSULTING Services for a perfect strategy. Make grow your business with PresenceMe Digital Marketing. DIGITAL STRATEGY for a Global Marketing Campaign. Increase your value and recognition around the world. SEO for your WEBSITE, AMAZON SEO listings, eBay SEO, BUSINESS SEO, LANDPAGE SEO, SPANISH SEO and more. Increase your ranking and be the first on searches. Go up to the top search engine ranking. NATIVE ADVERTISING: Engage your audience with native content. Get the consumer attention with native Ads. We are Spanish native from Spain. SPECIALISTS in SPANISH DIGITAL MARKETING and SPANISH CONTENT MARKETING: Reach the Spanish audience with the right message. Connect your business with the Spanish Speaking people all around the world. We are SPANISH NATIVE from Spain (Europe). COPYWRITING SERVICES Copywriting for your website, articles, press notes, blogs, posts, Amazon listings and all you need! ENGLISH DIGITAL MARKETING: The most effective strategies for your business. Let's speak. EXPERIENCE and EDUCATION: We have an extensive experience and education in Digital Marketing, SEO, SEM and Content Marketing. PHILOSOPHY: No challenge too big. No detail too small. All challenges accepted. We are committed to your project. OUR CUSTOMERS ARE OUR BEST INTRODUCTION. "They delivered us a work of quality extremely fast, I am bookmarking their profile for all our next projetcs and recommend them without any hesitation"
"I have been really impressed with the dedication to get this job completed correctly. I would have no hesitation using their skills again. Top work!" "Really good, fast service. Thank you! We'll get to work together in the future!" "They did a great job for our company and on a rather difficult project, they went beyond the expectations and performed in a stellar manner. They were timely, professional, and reliable. We will retain them again in the future for other similar projects." "Professional, very cooperative and doing an excellent work. Very good communication skills." "It was a pleasure working with you! Especially the communication between us deserve the highest star. I would hire you again." "They did a great job for us, and a fast turn around. We look forward to continue building a great working relationship with them, for many future projects." "They finished the task very quickly and efficiently. Highly recommend them and would like to work again!" "They are delightful. I enjoyed their work. They are professional, very cooperative and do excellent work." "A great person to work with! Professional to the fullest!." The best DIGITAL MARKETING for you. We offer Content Marketing in Spanish and English. We know about the Spanish Market as well the English ones. Specialists in communicate with the target audience, Spanish Native Team, with SEO knowledge. SEO Copywriting services. SEO content. Native ads. SEO and SEM for your Website. Our SEO strategy is natural and effective. We can optimize your website, your brand and your business. No language barrier. Connect with your Spanish audience and English audience all over the world. Be present in all the markets. Create your e-commerce and sell all over the world. We can help you to create your online store under any professional platform and also under blogger! We can help you to create the Spanish version! PresenceMe can create your blog and website. Are you ready for your own blog or website? Nowadays you need to have one. A blog for your brand, your business, your professional resume, your personal blog and all you can imagine! Online Presence is a must. We can make you be present on the web, with the best reputation. To be on the loop you need to be online, we can help you. Social Media presence and Website presence. Domain Maintenance too. Translation, Edition and Proofreading services by Experienced mother-tongue translators, with SEO knowledge. We are native from Spain. Multi-language websites, articles, posts, texts and listings. English and German to Spanish. Connect with Spanish market. PresenceMe as a Digital Media Consultant can help you to define your strategies and your needs. We help you to have success. 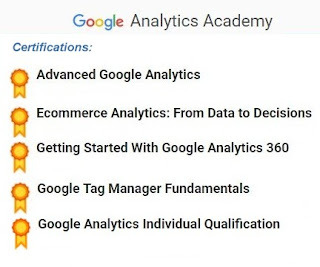 We have ALL the Google ANALYTICS Certifications: Individual Qualification (IQ), Google Tag Manager, Advanced Google Analytics, E-commerce Analytics and Google Analytics 360. This is a demonstration of our proficiency in Google Analytics, certified by Google. We have the Google ADWORDS Individual Qualification (IQ). This is a demonstration of our proficiency in Google Adwords, certified by Google, as an expert in online advertising. 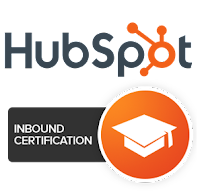 We have the Hubspot Inbound Certification. This is a demonstration of our proficiency in Inbound Methodology.